The Woonsocket Community Club hosted a blood drive with Vitalant, formerly United Blood Services, on Dec. 18 at the Community Center, which helped collect a total of 46 units of blood for patients in need. A total of 46 individuals volunteered to donate blood, and 39 individuals were able to donate at the Vitalant blood drive on Dec. 18. A total of seven donors also came forward to donate Power Red Cells (2RBC), which collects two units of red blood cells while returning platelets, plasma and a saline solution back to the donor. There were three people who donated for the first time. Vitalant expressed their gratitude to Gay Swenson, who coordinated the drive, and the Community Club which sponsored the blood drive. 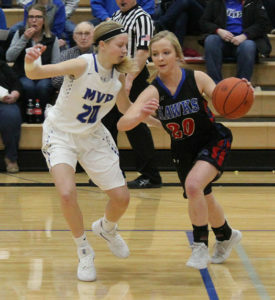 Madi Moody pushes the ball up the court for the Lady Blackhawks during their game on Tuesday, Dec. 18, in Plankinton. On Tuesday, Dec. 18, the SCW Blackhawks traveled to Plankinton for a doubleheader with the Mt. Vernon/Plankinton Titans. The junior varsity girls started the evening off with a victory and a final score of 30-16. The JV girls were followed by the JV boys, but the tables turned for the young Blackhawks as they took a loss with a final score of Blackhawks 19, Titans 35. Up next were the varsity Lady Blackhawks. They had a rough first half that found them too far behind to catch up once they came alive late in the third quarter. They took their first loss for the season with a final score of 35-48. The boys’ varsity game was the final game of the night. The Blackhawks came away with a solid win to keep their winning streak at 3-0. Final score for the Blackhawks’ victory was 69-43. …Read details about the games and see an additional picture in this week’s issue of the Sanborn Weekly Journal. The winners of the 2018 Woonsocket Elementary Poetry Slam are, front row, left to right: Norris Peterson, Parker Couch, Ava Potrament, Savana Larson, Ryker Forbes, Shiloh Terkildsen; middle row: Brinley Fuller, Ellie Hofer, Maren Peterson, Sara Overson, Denairic Lieber, Natasha Grosz, Megan Kogel; back row: Payton Weiting, Gage Hines, Emilie Lindgren, Yuli Garcia, Kali Hofer, Tyler Brueske, Makenzie Baruth, Danielle Brooks and Oscar Anderson. Not pictured: Ezra Schultz and Sutton Senska. On Tuesday, Dec. 18, the community was invited to attend the Woonsocket Elementary Poetry Slam. Students, Kindergarten through sixth grade, took turns reciting a previously selected poem that they had practiced both in school and at home. Poem themes ranged from thought provoking to silly and fun with contexts about puppies, dinosaurs, wormy apples and dealing with siblings. During the previous week, on Thursday, Dec. 13 and Friday, Dec. 14, volunteer judges came into the classrooms to hear the students recite their poems. The judges scored each student based on a rubric that included poem delivery speed, voice volume, eye contact and poem-appropriate gestures. Students who placed first, second and third in each grade level were announced at the end of the Poetry Slam on Tuesday and received a prize. …Read the names of the winners and see additional pictures of the poetry slam in this week’s issue of the Sanborn Weekly Journal!